6/18/2014 - Drafted this mechanic and card last week when Jules announced Tesla's core theme. It definitely needs work, but let's look at the pure idea first. I'm not proposing Mad Scientist be hybrid, but that he could easily be either color. Experiment is an action word very similar to cascade. It has no upper limit, allowing you to luck into as expensive a spell as you're willing to put in your deck. Cascade was quite powerful already so this should be setting alarm bells off in your head. The downside meant to counteract this huge effect is life loss ala Dark Confidant. If experimenting were something you could do for free every turn, it would be significantly better than Bob (one of the best two-drop creatures of all time) since it also casts the spell for free. It wouldn't be strictly better because experiment is guaranteed to cost you 1+ life every time, and also rewards you for playing more expensive spells than Bob does. 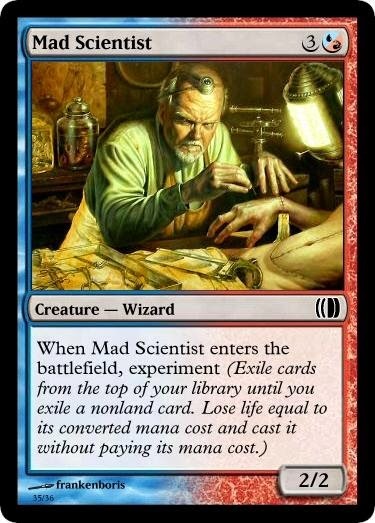 All that adds up to experiment killing you even faster, but we also probably wouldn't print "At your upkeep, experiment" on anything costing less than 6 or 7 mana. I would be a little surprised if experiment proved to be balanced as proposed above. It's fairly likely that there's not even a cost where we can safely print the mechanic as-is that won't be so expensive players will hate it. What I would try to preserve as we iterate on it are the core ideas that we can't know exactly what the result of the experiment will be, and that there is a cost or a risk associated with it. Ay-yi-yi! That is a dangerous keyword! Why does it have to cast it for free? "You may cast that card that turn" would still be pretty good, and costed much cheaper. It doesn't have to cast for free. Allowing you to cast it (for cost) this turn would be very red., Would we want a keyword that only fits red? Would we bleed it into other colors? I think this mechanic might work better limited to a cycle, either a 5 color rare cycle or a vertical cycle in red. I was expecting more alternate ideas. Doesn't this mechanic make you mad? Don't you think you could make something better? If you would draw a card, instead exile cards from the top of your library until you exile a nonland card. Lose 1 life for each card exiled this way. Put all cards exiled this way into your hand. Hmm, Abundance (or Countryside Crusher) that draws you the lands too. Nice card. Wouldn't be shocked to see this at 5/5, 4/6, 6/4 or frankly even 6/6 given modern mythics. "At the beginning of your upkeep, exile the top card of your library and add mana to your mana pool equal to the amount of coloured mana in its cost. Then exile another card from the top of your library and cast it using the mana produced this way if able." A bit too wordy, and Charmed Pendant's text isn't a good choice for embedding into a keyword, but there's an interesting idea hiding in there. I meant to say this is intended as a oneoff card, or perhaps the rare from a vertical cycle of three cards. Does it add colorless mana equal to the amount of colored mana, or does it add the same colored mana? Can you add more mana if the second card is more expensive? "Reveal cards from the top of your library until you reveal two nonland cards. If one of them costs less than the other, you may cast it without paying its mana cost." I was intending that it'd add the same coloured mana as in the card you exile - or perhaps just add the whole mana cost of the card you exile - then you could indeed "top up" the casting of the second if necessary. lpaulsen's idea is close to what I imagined and a lot less fiddly, though. I like study, but how do you track what you paid? You could use counters, but those only handle colorless mana well. More importantly, is it better than echo? As templated, study *only* reduces costs by colorless, so dice or counters would be a natural way to track it. I'm not prepared to claim that it's better than echo, but at the very least it's substantially different. 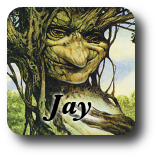 For starters, it conceals the card being cast, allows for waits of any length, and works on instants/sorceries. Maybe we should give Experiment a fixed number, like Experiment X (exile the top X cards of your library. You may cast a nonland card without paying its mana cost. Lose life equal to that card's convert mana cost). I'm still a little weary of the ability, but a fixed number could potentially keep it in check. I'm almost tempted to remove the nonland clause to avoid the sigh when you exile 5 lands.